[Image: Mehrangarh Fort, Jodhpur, Rajasthan, India; photo by BLDGBLOG (view larger)]. Continuing with the recent series of posts showing photos from India—with apologies in advance for anyone who doesn’t want to see these, as I will doubtless keep going for at least several more posts—here are some photos from the utterly fantastic 15th-century Mehrangarh Fort in Jodhpur, Rajasthan. [Image: Mehrangarh Fort, Jodhpur; photo by BLDGBLOG]. Mehrangarh is a massive hillside castle on a rocky site filled with moats, walls, battlements, gardens (holding what was described to us, rightly or wrongly, as one of India’s first pomegranate trees), an elaborate palace of balconies, arched galleries, and heavily ornamented private residences, and seemingly miles of strategically twisty, misleading passageways and stairs. [Image: Inside Mehrangarh Fort, Jodhpur; photo by BLDGBLOG]. All of it overlooks a sprawling desert city lined with the beautiful blue-washed houses of local brahmins. [Images: Overlooking Jodhpur, including the city’s many blue brahmin houses; photos by BLDGBLOG]. [Images: Walking around Jodhpur; photos by BLDGBLOG]. —heading up and around again to the fort itself, that hangs over everything like a ship. [Image: Mehrangarh Fort, Jodhpur, as seen from our hotel; photo by BLDGBLOG]. [Image: Birds flying over Mehrangarh Fort, Jodhpur; photo by BLDGBLOG]. For now, though, here are many, many, many, many photographs, mixing both DSLR and Instagram (where I am bldgblog, if you want to follow my feed). However, for the sake of not spending the entire day captioning these images, I will simply let the photos themselves tell the story of our visit. Note, though, because I particularly like this detail, that the spike-studded door you’ll see pictured down below is found at the end of a very long, slowly rising ramp, but that that the door itself is installed 90-degrees off from the angle of direct approach. This right angle dramatically reduced the threat (and velocity) of direct charges from battle-elephants, who would thus have been forced to turn extremely quickly in order to collide with the door at all (and, even if the elephant could pivot successfully, it would then ram its head onto the spikes). Details like this—let alone the dust-covered otherworldly feel of the entire place—give any castle in Europe a run for its money. 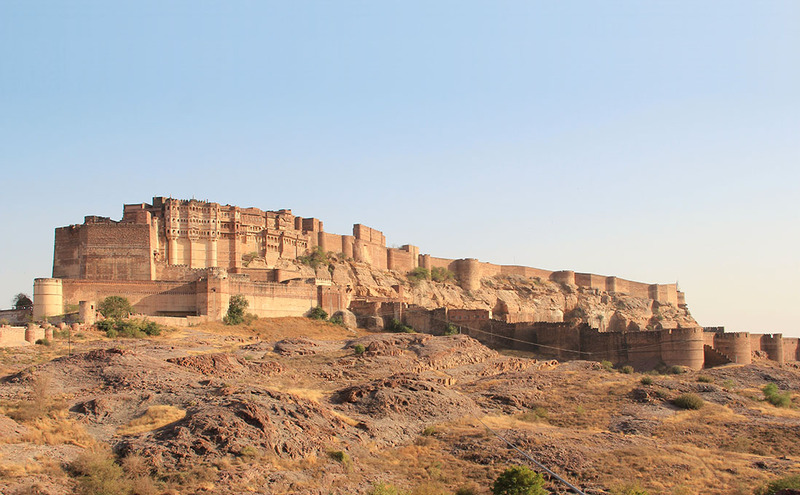 At times, Mehrangarh felt like a Norman castle—or remote Welsh keep—on steroids (but wait till you see the even more massive and remote fortress of Kumbhalgarh, photos of which I’ll also post soon). [Images: Mehrangarh Fort, Jodhpur; photos by BLDGBLOG]. Anyway, here are some images. Meanwhile, don’t miss recent posts exploring Chand Baori and the Raniji Ki stepwell.